Photo by Anthony Westkamper A female grappletail, or Octogomphus specularis, newly emerged..
Photo by Anthony Westkamper Hoverfly with pollinea stuck to its back. Today I was discouraged that there were a lot of people down along "my" stretch of the river. They stir up the bugs, making getting good shots difficult. Sure enough, although I saw several dragonflies, none seemed in the mood to pose, so I walked near the outer edge of the riverbed where the trees overshadow the rocks. I was delighted to spot the locally common chatterbox orchids (Epipactis gigantea) blooming in the seeps where I see them every year. A quick movement caught my eye. It was a common hoverfly with something large and bright yellow attached to its back. As I took photos of the insect serially visiting the blossoms it dawned on me. Orchids sport some of the most highly developed flowers in the plant kingdom. Some tropical species go so far as to emulate the scent and female genitalia of certain species of moth, inducing the males to mate with the flower thereby carrying pollen from one bloom to another. Whenever I see an orchid in the wild I wonder what its specific adaptation might be. I have never seen any reference to this particular species of orchid and an insect pollinator. 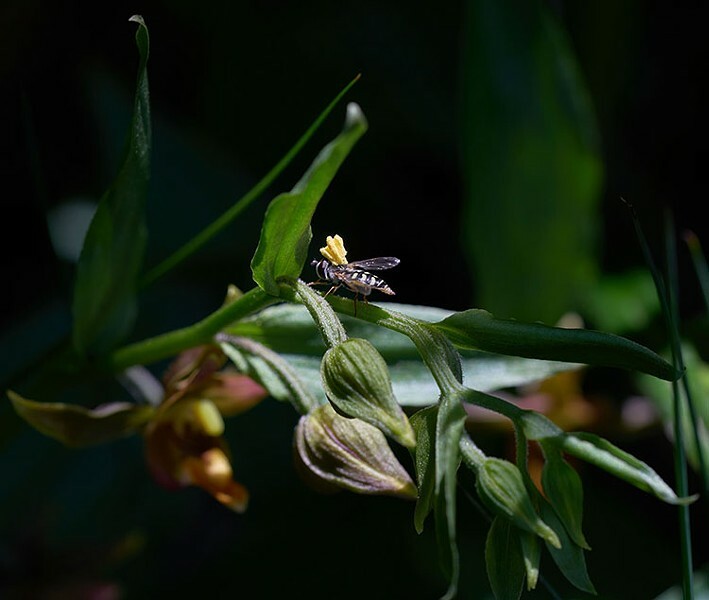 Apparently, the flower glues its pollen producing organ to the back of the bug which then flies from plant to plant carrying the entire mass with it and rubbing against the flower's appropriate "lady parts." All of this brings to mind that the entire evolution of flowers was for plants to take advantage of the mobility of animals, namely insects, to accomplish a more efficient pollinating process. One only has to look at the prodigious pollen production of pines in the spring to see how wasteful the broadcast system is. There would appear to be only one organism even more efficient at pollination than insects: Human pollination works exceedingly well for roses, petunias, tulips and, yes, orchids. The natural world's penultimate pollinator may well be people — just like the hoverfly, we're doing the plant's work when we propagate them. On a recent stroll along my favorite section of the Van Duzen River, I saw about a dozen dragonflies of at least five species. I was able to get close enough to get photos of three individuals. Two of those were species I'd never seen before, the spot winged glider and the grappletail. The latter specimen flew weakly, though her colors were bright, and her wings pristine, leading me to believe she had only hours previously emerged from the river and shucked her larval shell. I only recently totaled up how many different varieties I've encountered in the last seven years of actively photographing and identifying them. In that time I've had two county firsts, being the first person to ever report sighting a species in a given county — Emma's dancer in Del Norte and red rock skimmer in Humboldt. 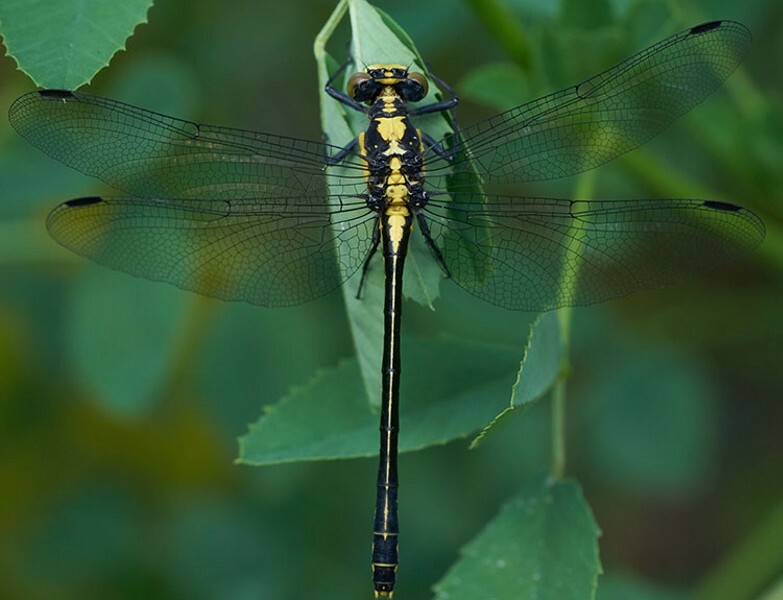 And I've got bragging rights for reporting the last dragonfly of the year and the first statewide for the variegated meadow hawk, which is unique for overwintering in our area. It's great fun and my personal list right now stands at 23 species, all of which are from Humboldt or adjacent counties. Dragonflies stand out as a gateway drug to the addiction of amateur entomology. There are relatively few species to learn (about 72 in all of California), they are large, showy insects that are easy to recognize, and are fascinating organisms in their own right. The study of even such a small, well-known and much studied group is in no way a "done deal" with everything being already known. Amateurs can and do frequently add to our knowledge about them.